Everyone in Roshni's class admired her new mobile phone and Roshni felt proud to own it. Roshni was a cute little rabbit who lived in Sundervan. She had been very excited of late. Well, Roshni was looking forward to her Uncle Roli’s visit, and was awaiting his arrival eagerly. Uncle Roli was her favourite uncle and worked in England. Uncle Roli would bring many interesting and unusual gifts whenever he came to visit Roshni. Roshni would show these gifts to her friends and classmates and feel very proud since no one had seen such things before. When Uncle Roli finally arrived, he gave Roshni a unique mobile phone as a present. It was pink in colour and there were pictures of pretty dolls engraved all over it. The mobile phone had a good collection of audio as well as video songs. The quality of the photographs and videos the phone took was very good too. Roshni was fascinated by her new mobile phone. She spent hours listening to music and played games on it, instead of playing with the other children in the park. She even used it to click photographs and shoot videos. And even though it was strictly forbidden, Roshni started carrying the mobile phone to school. She would use it in the lunch break to click photographs of her friends. Everyone in Roshni’s class admired her new mobile phone and Roshni felt proud to own it. “May we borrow your mobile phone to click a photograph, Roshni?” some of her classmates would ask. “May we listen to a song on it, or use it to make a video?” some others would request. Roshni realised how fascinating her mobile phone seemed to everyone and she decided to take advantage of it. She would then ask her friends to buy her a chocolate bar or pastry for her, and often even get them to do her homework in return. Soon, Roshni began to behave like a pampered princess who enjoyed everyone’s attention and also the favours they showered on her. Sadly, what she didn’t realise was that she was losing out on many important things. Since Roshni was no longer doing her homework on her own, she was losing touch with her lessons. And since she wasn’t going out to play, she was turning unhealthy. And since she was only letting the others use her mobile phone in return for a favour, she was gaining the reputation of being a snob. As a result, Roshni fared very badly in her exams. And when the results were out, she was terrified. “I can’t let Mom and Dad see my low marks,” she said, worried about what her parents would say if they came across her report card. One day, Roshni’s class went for a picnic to the banks of the Manmohini River. As usual, she started clicking photographs with her mobile phone. 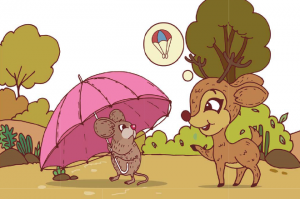 Roshni’s friend Sneha Deer had brought a big bar of chocolate and a pair of pretty earrings. She had planned to give them to Roshni in return for clicking her photographs. Roshni quietly pocketed the goodies and asked Sneha Deer to pose near a rock. She then went closer to the riverside to click a picture. Suddenly, Roshni lost her balance and fell into the river. The river currents were very strong and Roshni was afraid that she would drown. Fortunately, Roshni’s classmates Appu Elephant and Lambu Giraffe were close by. They heard Roshni’s screams and jumped into the river. Both Appu Elephant and Lambu Giraffe were good swimmers. In no time, they pulled Roshni out of the river. Tweety Parrot saw Roshni’s mobile phone bobbing in the water. He flew to it quickly and picked it up just before it could sink. He then took it to Roshni. Roshni’s class mates then arranged for some hot tea for Roshni to drink. Roshni felt grateful and thanked all her friends for helping her. In the meanwhile, back at Roshni’s house, Mrs. Rabbit decided to clean Roshni’s room. She was dusting Roshni’s bag when she found the report card. Mrs. Rabbit was extremely upset when she realised that Roshni had hidden the report card from her. And more so, when she saw Roshni’s low marks. It was a bill for a whopping amount of twelve hundred rupees for a month’s use of the mobile phone. “I am going to have a word with Roshni as soon as she gets home!” Mrs. Rabbit decided immediately. But when Roshni returned home, Mrs. Rabbit found that she was running a fever. Roshni explained how she had fallen into the river and was forced to wear wet clothes all day. Mrs. Rabbit immediately gave Roshni a spoonful of some very bitter tasting medicine and a tablet that Roshni found very hard to swallow. She then tucked Roshni in bed and put her to sleep. Roshni slept very restlessly that night. “I do not want a mobile phone! 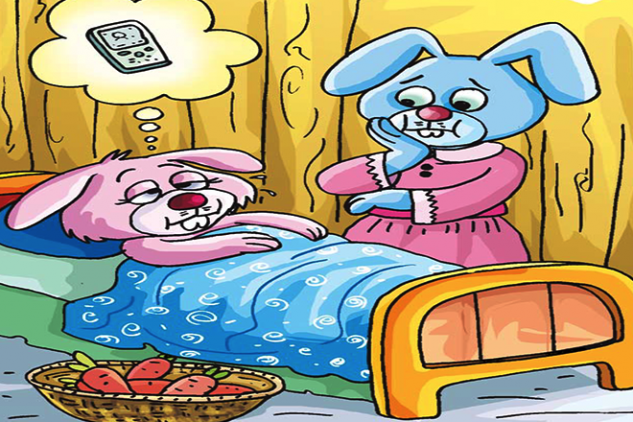 I do not want a mobile phone!” she kept mumbling in her sleep. Mrs. Rabbit realised that Roshni had already learnt her lesson. When Roshni was better after a few days, Mrs. Rabbit showed her the phone bill and the report card she had found. She also brought it to Roshni’s notice of how unfair she had been to her friends by asking them to do her favours. Roshni hung her head and apologised. She then handed her mobile phone over to her mother. The mobile phone had stopped working since it had been drenched with water. Mr. Rabbit decided that he wouldn’t bother to repair the phone and simply threw it away. Roshni missed her mobile phone for a few days. But after that, she began enjoying studying and playing outdoor games. She worked extra hard for she realised that she had to score higher marks to make up for the marks she had lost in the first exam. She also apologised to her friends for having asked them for favours. Roshni did very well in the next exam. And when Uncle Roli phoned to congratulate her, he asked her what she would like as a gift when he next came to visit.